The filter housings comprise of the high flow filters, aluminium cowls, V-Band clamp, laser cut brackets and the carbon pods themselves. The carbon pods shroud the reverse mounted filter and smoothly shape the airflow down to the intake tubes. This smooth reduction in cross sectional area invokes the Venturi effect where the airflow accelerates whilst maintaining laminar conditions. 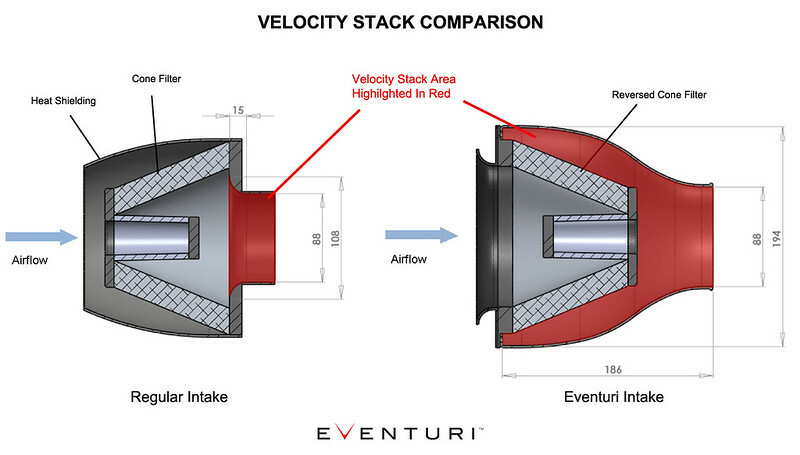 It can be thought of as a large velocity stack - below is a diagram to show the comparison between our patent pending design and a regular intake system. Further details can be read in the Technology page. lthough now semi-open, IATs are still kept consistently low with the front scoops which saturate the area in front of the filters with ambient air. More details on the scoops later. Free Next Day UK Delivery if ordered before 11am! We can also ship worldwide, simply enter your full address during checkout including the correct postal code for a shipping quote.